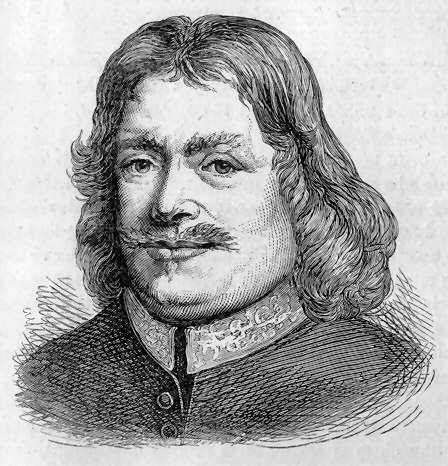 John Bunyan (1628–1688). The Pilgrim’s Progress. AS I walk’d through the wilderness of this world, I lighted on a certain place where was a Den, and I laid me down in that place to sleep; and as I slept, I dreamed a Dream. I dreamed, and behold I saw a Man cloathed with Rags, standing in a certain place, with his face from his own house, a Book in his hand, and a great Burden upon his back. I looked, and saw him open the Book, and read therein; and as he read, he wept and trembled; and not being able longer to contain, he brake out with a lamentable cry, saying What shall I do? In this plight therefore he went home, and refrained himself as long as he could, that his Wife and Children should not perceive his distress, but he could not be silent long, because that his trouble increased: Wherefore at length he brake his mind to his Wife and Children; and thus he began to talk to them: O my dear Wife, said he, and you the Children of my bowels, I your dear friend, am in myself undone by reason of a Burden that lieth hard upon me; moreover, I am for certain informed that this our City will be burned with fire from Heaven; in which fearful overthrow, both myself, with thee my Wife, and you my sweet Babes, shall miserably come to ruin, except (the which yet I see not) some way of escape can be found, whereby we may be delivered. At this his Relations were sore amazed; not for that they believed that what he had said to them was true, but because they thought that some frenzy distemper had got into his head; therefore, it drawing towards night, and they hoping that sleep might settle his brains, with all haste they got him to bed: But the night was as troublesome to him as the day; wherefore, instead of sleeping, he spent it in sighs and tears. So, when the morning was come, they would know how he did; He told them Worse and worse: he also set to talking to them again, but they began to be hardened: they also thought to drive away his distemper by harsh and surly carriages to him; sometimes they would deride, sometimes they would chide, and sometimes they would quite neglect him: Wherefore he began to retire himself to his chamber, to pray for and pity them, and also to condole his own misery; he would also walk solitarily in the fields, sometimes reading, and sometimes praying: and thus for some days he spent his time. Then said Evangelist, If this be thy condition, why standest thou still? He answered, Because I know not whither to go. Then he gave him a Parchment-roll, and there was written within, Fly from the wrath to come. Now he had not run far from his own door, but his Wife and Children, perceiving it, began to cry after him to return; but the Man out his fingers in his ears, and ran on, crying Life! Life! Eternal Life! So he looked not behind him, but fled towards the middle of the Plain. The Neighbors also came out to see him run; and as he ran, some mocked, others threatened, and some cried after him to return; and among those that did so, there were two that resolved to fetch him back by force. The name of the one was Obstinate, and the name of the other Pliable. Now by this time the Man was got a good distance from them; but however they were resolved to pursue him, which they did, and in a little time they overtook him. Then said the Man, Neighbors, wherefore are you come? They said, To persuade you to go back with us. But he said, That can by no means be; you dwell, said he, in the City of Destruction, the place also where I was born, I see it to be so; and dying there, sooner or later, you will sink lower than the Grave, into a place that burns with Fire and Brimstone: be content, good Neighbors, and go along with me. Chr. Yes, said Christian, for that was his name, because that all which you shall forsake is not worthy to be compared with a little of that that I am seeking to enjoy; and if you will go along with me and hold it, you shall fare as I myself; for there where I go, is enough and to spare: Come away, and prove my words. Chr. I seek an Inheritance incorruptible, undefiled, and that fadeth not away, and it is laid up in Heaven, and safe there, to be bestowed at the time appointed, on them that diligently seek it. Read it so, if you will, in my Book. Obst. Come then, Neighbor Pliable, let us turn again, and go home without him; there is a company of these craz’d-headed coxcombs, that, when they take a fancy by the end, are wiser in their own eyes than seven men that can render a reason. Pli. Then said Pliable, Don’t revile; if what the good Christian says is true, the things he looks after are better than ours; my heart inclines to go with my Neighbor. Obst. What! more fools still? Be ruled by me, and go back; who knows whither such a brain-sick fellow will lead you? Go back, go back, and be wise. Chr. Come with me, Neighbor Pliable; there are such things to be had which I spoke of, and many more Glories besides. If you believe not me, read here in this Book; and for the truth of what is exprest therein, behold, all is confirmed by the blood of Him that made it. Pli. Well, Neighbor Obstinate, said Pliable, I begin to come to a point: I intend to go along with this good man, and to cast in my lot with him: but, my good companion, do you know the way to this desired place? Chr. I am directed by a man, whose name is Evangelist, to speed me to a little Gate that is before us, where we shall receive instructions about the way. Obst. And I will go back to my place, said Obstinate; I will be no companion of such mis-led, fantastical fellows. Now I saw in my Dream, that when Obstinate was gone back, Christian andPliable went talking over the Plain; and thus they began their discourse. Chr. Come Neighbor Pliable, how do you do? I am glad you are persuaded to go along with me: Had even Obstinate himself but felt what I have felt of the powers and terrors of what is yet unseen, he would not thus lightly have given us the back. Pli. Come, Neighbor Christian, since there are none but us two here, tell me now further what the things are, and how to be enjoyed, whither we are going? Chr. There is an endless Kingdom to be inhabited, and everlasting Life to be given us, that may inhabit that Kingdom for ever. Chr. There are Crowns of glory to be given us, and Garments that will make us shine like the Sun in the firmament of Heaven. Chr. There shall be no more crying, nor sorrow, for He that is owner of the place will wipe all tears from our eyes. Chr. There we shall be with Seraphims and Cherubins, creatures that will dazzle your eyes to look on them: There also you shall meet with thousands and ten thousands that have gone before us to that place; none of them are hurtful, but loving and holy; every one walking in the sight of God, and standing in his presence with acceptance for ever. In a word, there we shall see the Elders with their golden Crowns, there we shall see the Holy Virgins with their golden Harps, there we shall see men that by the World were cut in pieces, burnt in flames, eaten of beasts, drowned in the seas, for the love that they bare to the Lord of the place, all well, and cloathed with Immortality as with a garment. Pli. The hearing of this is enough to ravish one’s heart; but are these things to be enjoyed? How shall we get to be sharers hereof? Chr. The Lord, the Governor of the country, hath recorded that in this Book; the substance of which is, If we be truly willing to have it, he will bestow it upon us freely. Chr. I cannot go so fast as I would, by reason of this Burden that is upon my back. Now I saw in my Dream, that just as they had ended this talk, they drew near to a very miry Slough, that was in the midst of the plain; and they, being heedless, did both fall suddenly into the bog. The name of the slough wasDispond. Here therefore they wallowed for a time, being grievously bedaubed with the dirt; and Christian, because of the Burden that was on his back, began to sink in the mire. Pli. At that Pliable began to be offended, and angerly said to his fellow, Is this the happiness you have told me all this while of? If we have such ill speed at our first setting out, what may we expect ’twixt this and our Journey’s end? May I get out again with my life, you shall possess the brave Country alone for me. And with that he gave a desperate struggle or two, and got out of the mire on that side of the Slough which was next to his own house: so away he went, and Christian saw him no more. Wherefore Christian was left to tumble in the Slough of Dispond alone; but still he endeavoured to struggle to that side of the Slough that was still further from his own house, and next to the Wicket-gate; the which he did, but could not get out, because of the Burden that was upon his back: But I beheld in my Dream, that a man came to him, whose name was Help, and asked him, What he did there? Chr. Sir, said Christian, I was bid go this way by a man called Evangelist,who directed me also to yonder Gate, that I might escape the wrath to come; and as I was going thither, I fell in here. Help. Then said he, Give me thy hand: so he gave him his hand, and he drew him out, and set him upon sound ground, and bid him go on his way. Then I stepped to him that pluckt him out, and said, Sir, wherefore, since over this place is the way from the City of Destruction to yonder Gate, is it that this plat is not mended, that poor travellers might go thither with more security? And he said unto me, This miry Slough is such a place as cannot be mended; it is the descent whither the scum and filth that attends conviction for sin doth continually run, and therefore it is called the Slough of Dispond; for still as the sinner is awakened about his lost condition, there ariseth in his soul many fears and doubts, and discouraging apprehensions, which all of them get together, and settle in this place: And this is the reason of the badness of this ground. It is not the pleasure of the King that this place should remain so bad. His labourers also have, by the direction of His Majesties Surveyors, been for above these sixteen hundred years employed about this patch of ground, if perhaps it might have been mended: yea, and to my knowledge, said he, here hath been swallowed up at least twenty thousand cart-loads, yea, millions of wholesome instructions, that have at all seasons been brought from all places of the King’s dominions (and they that can tell say they are the best materials to make good ground of the place), if so be it might have been mended, but it is the Slough of Dispond still, and so will be when they have done what they can. True, there are by the direction of the Lawgiver, certain good and substantial steps, placed even through the very midst of this Slough; but at such time as this place doth much spue out its filth, as it doth against change of weather, these steps are hardly seen; or if they be, men through the dizziness of their heads, step besides; and then they are bemired to purpose, notwithstanding the steps be there; but the ground is good when they are once got in at the Gate. Now I saw in my Dream, that by this time Pliable was got home to his house again. So his Neighbors came to visit him: and some of them called him wise man for coming back, and some called him fool for hazarding himself with Christian: others again did mock at his cowardliness; saying, Surely since you began to venture, I would not have been so base to have given out for a few difficulties. So Pliable sat sneaking among them. But at last he got more confidence, and then they all turned their tales, and began to deride poor Christian behind his back. And thus much concerning Pliable. Now as Christian was walking solitary by himself, he espied one afar off come crossing over the field to meet him; and their hap was to meet just as they were crossing the way of each other. The gentleman’s name that met him was Mr Worldly Wiseman: he dwelt in the Town of Carnal Policy, a very great Town, and also hard by from whence Christian came. This man then meeting with Christian, and having some inkling of him,—for Christian’s setting forth from the City of Destruction was much noised abroad, not only in the Town where he dwelt, but also it began to be the town-talk in some other places,—Master Worldly Wiseman therefore, having some guess of him, by beholding his laborious going, by observing his sighs and groans, and the like, began thus to enter into some talk with Christian. Chr. A burdened manner indeed, as ever I think poor creature had. And whereas you ask me, Whither away? I tell you, Sir, I am going to yonder Wicket-gate before me; for there, as I am informed, I shall be put into a way to be rid of my heavy Burden. Chr. Yes, but I am so laden with this Burden, that I cannot take that pleasure in them as formerly; methinks I am as if I had none. World. I would advise thee then, that thou with all speed get thyself rid of thy Burden; for thou wilt never be settled in thy mind till then; nor canst thou enjoy the benefits of the blessing which God hath bestowed upon thee till then. Chr. That is that which I seek for, even to be rid of this heavy Burden; but get it off myself, I cannot; nor is there any man in our country that can take it off my shoulders; therefore am I going this way, as I told you, that I may be rid of my Burden. Chr. A man that appeared to me to be a very great and honorable person; his name as I remember is Evangelist. World. I beshrew him for his counsel; there is not a more dangerous and troublesome way in the world than is that unto which he hath directed thee; and that thou shalt find, if thou wilt be ruled by his counsel. Thou hast met with something (as I perceive) already; for I see the dirt of the Slough of Dispond is upon thee; but that Slough is the beginning of the sorrows that do attend those that go on in that way: Hear me, I am older than thou; thou art like to meet with, in the way which thou goest, Wearisomeness, Painfulness, Hunger, Perils, Nakedness, Sword, Lions, Dragons, Darkness, and in a word, Death, and what not! These things are certainly true, having been confirmed by many testimonies. And why should a man so carelessly cast away himself, by giving heed to a stranger? Chr. Why, Sir, this Burden upon my back is more terrible to me than are all these things which you have mentioned; nay, methinks I care not what I meet with in the way, so be I can also meet with deliverance from my Burden. World. I thought so; and it is happened unto thee as to other weak men, who meddling with things too high for them, do suddenly fall into thy distractions; which distractions do not only unman men (as thine I perceive has done thee), but they run them upon desperate ventures, to obtain they know not what. World. But why wilt thou seek for ease this way, seeing so many dangers attend it? Especially, since (hadst thou but patience to hear me) I could direct thee to the obtaining of what thou desirest, without the dangers that thou in this way wilt run thyself into; yea, and the remedy is at hand. Besides, I will add, that instead of those dangers, thou shalt meet with much safety, friendship, and content. World. Why in yonder Village (the village is named Morality) there dwells a Gentleman whose name is Legality, a very judicious man, and a man of very good name, that has skill to help men off with such burdens as thine are from their shoulders: yea, to my knowledge he hath done a great deal of good this way; ay, and besides, he hath skill to cure those that are somewhat crazed in their wits with their burdens. To him, as I said, thou mayest go, and be helped presently. His house is not quite a mile from this place, and if he should not be at home himself, he hath a pretty young man to his Son, whose name is Civility, that can do it (to speak on) as well as the old Gentleman himself; there, I say, thou mayest be eased of thy Burden; and if thou art not minded to go back to thy former habitation, as indeed I would not wish thee, thou mayest send for thy Wife and Children to thee to this village, where there are houses now stand empty, one of which thou mayest have at reasonable rates; Provision is there also cheap and good; and that which will make thy life the more happy is, to be sure there thou shalt live by honest Neighbors, in credit and good fashion. Now was Christian somewhat at a stand, but presently he concluded, If this be true which this Gentleman hath said, my wisest course is to take his advice; and with that he thus farther spoke.